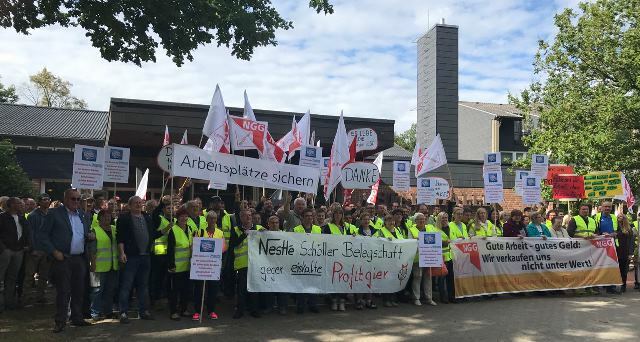 Barely 11 months after the creation of the ice cream joint venture by Nestlé and the French private equity firm PAI Partners, workers at the former Nestlé factory in Uelzen, in northern Germany, have been informed that the company intends to slash jobs and terms and conditions. The company calls its proposals a "rescue package": accept them or the factory will be closed and production transferred to "more competitive factories". In addition to over 180 job cuts amounting to 50% of the factory's workforce, the company wants to withdraw from the branch agreement and replace it with an enterprise agreement in order to lower wages and slash benefits. At a mass meeting on 17 September, NGG members at Froneri vowed to fight and will demand negotiations around job security. At the IUF 27th Congress, 29 August - 1 September 2017, delegates representing Nestlé workers signed a statement of solidarity with Froneri workers in Germany . The IUF has assured the NGG of practical support and informed Nestlé that we hold them responsible for attacks on labour rights at Froneri.